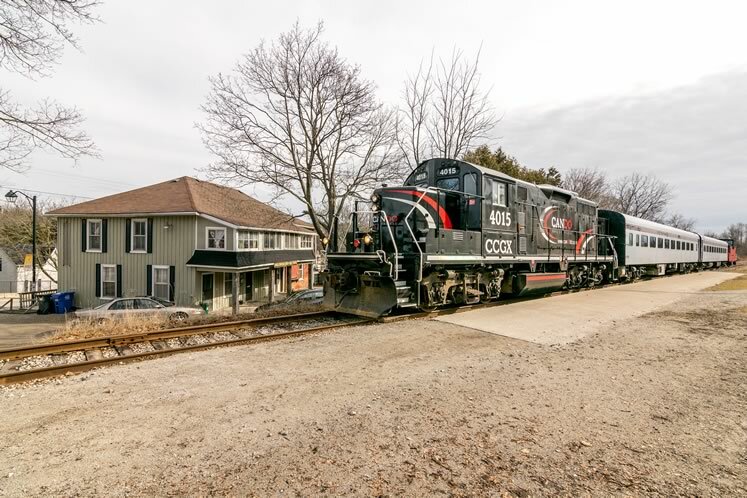 As a new operator steers onto the Orangeville-Brampton Railway, staff, passengers and railfans reflect on the past and the future of trains in our region. Under bright blue, late June skies, train engineer Steve Bradley pulls the Cando Rail Services locomotive into the Canadian Pacific Railway junction in Streetsville, just as he’s done on both freight and tourist trains for nearly 20 years. But today is different. The train is operating “light power,” trainspeak for travelling with no cars attached, because the locomotive itself is the cargo. This is the last time a Cando train will glide along this stretch of track, the 55-kilometre Orangeville-Brampton Railway (OBRY). After Bradley and conductor Steve Thomas are done, their ride will be shipped to another operation run by the Manitoba-based company. Cando’s beloved Credit Valley Explorer tourist train made its last run at the end of February. 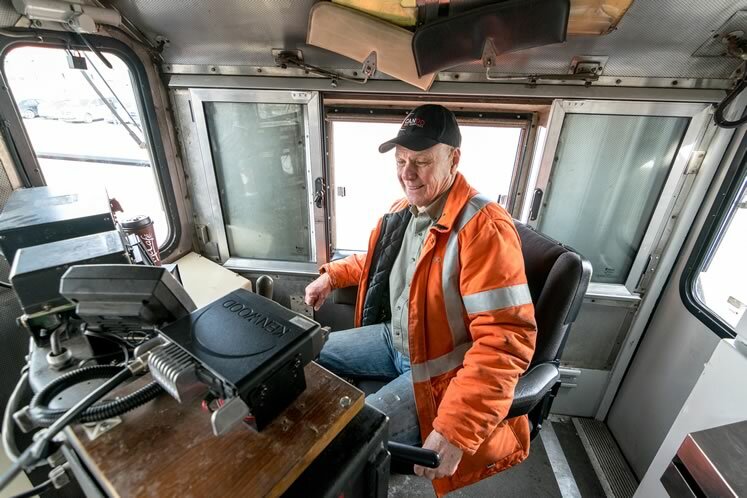 Steve Bradley sits in the locomotive cab at the Streetsville Junction on one of his last trips on the OBRY. Photo by Warren Schlote. The engine’s rumbling idle slows, then fades to silence. Bradley gets out and locks the cab, looking up at his locomotive. The moment has come to say goodbye to his front-row seat on the best views in the region. “It’s always sad to do the last trip anywhere,” he says, reflecting on the day a little later in the summer. 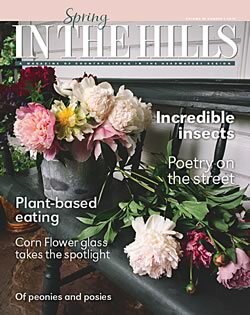 For many Headwaters residents, the OBRY – bought by the Town of Orangeville from CPR in 2000 – is a nostalgia-stirring local fixture. They can hear its trains chugging through their villages, some of their workplaces rely on its twice-weekly industrial freight deliveries, and many of them have enjoyed one of the three-hour, 75-kilometre scenic Credit Valley Explorer trips from Orangeville to Snelgrove and back, or since 2004, one of the shorter one-hour winter Santa Trains between Orangeville and Inglewood. Its appeal stretches beyond Headwaters, too. Railfans – train lovers keen on everything from locomotive and rolling stock makes and models to shipping schedules and the history of tracks and the loads they carry – from as far away as Quebec are here to mark the occasion with Bradley. They have come to bear witness and thank him for sharing their passion during his years of service. They snap photos and say farewell to the crew. Alton resident and teenage railfan Martin Kulcsar had followed the final train along its entire route. 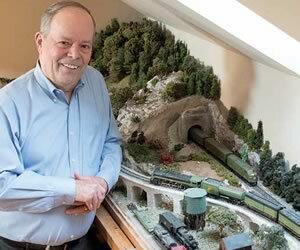 “It was a special feeling in the morning since I knew it would be the last time I would see them in Orangeville,” he says the next day as he sits near the N scale model railway (named because there’s 9 mm between the rails) he’s constructing in his bedroom. The Credit Valley Explorer makes a final stop in Inglewood. The village has been a regular stop on fall and winter tourist trips, including the popular Santa Train holiday runs. Photo by Warren Schlote. When Cando announced in February its decision to halt operations, company officials cited changing times and untenable costs – raising the spectre that nearly 140 years of history could grind to a halt. However, a new player, Gio Railways, received its operating certificate on June 29, and will take the controls from here. At its peak from the late 19th century and into the early 20th century, Orangeville was connected to the national passenger railway network by two companies. The Credit Valley Railway, whose former track is part of the OBRY, was founded in 1871 and had built a line from Orangeville to Toronto via Streetsville by the end of 1879. 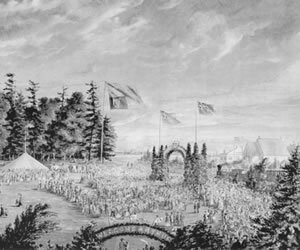 In 1883, a subsidiary of Canadian Pacific Railway assumed operations of the Toronto, Grey and Bruce Railway, extending the line to Owen Sound via Bolton. Soon afterward, CPR bought the Credit Valley Railway too. In 1932 the line connecting Orangeville to Bolton was abandoned. According to rail expert R.L. 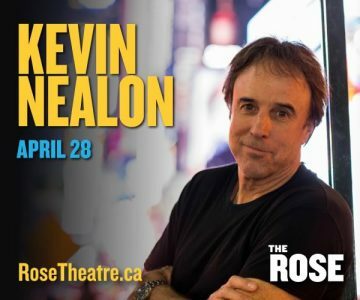 Kennedy, in that era there were two passenger trains in each direction between Toronto and Owen Sound daily, except on Sundays. The trip took six hours one way – though track improvements later cut travel time by an hour, Kennedy writes on his website Old Time Trains. In addition to travellers, trains also carried bulk freight and mail. 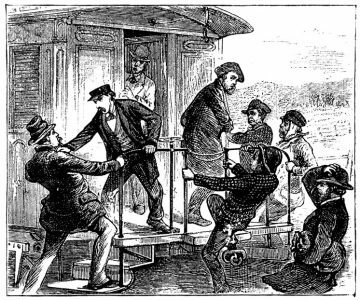 The latter was so good for business that the loss of a mail run often tipped a passenger service into unsustainability. The service continued to deteriorate after the region switched to mail truck delivery in 1958 and as automobile use continued to grow. Before long, a round trip to Owen Sound took two days. The last passenger train rolled out of Owen Sound on October 30, 1970. The final freight train would leave 15 years later, nearly to the day. After the Town of Orangeville bought OBRY in 2000, it formed Orangeville Railway Development Corporation (ORDC), with the Town as sole shareholder. At the time, the economic benefits of a shipping line for local manufacturers and the potential for a tourist train service were key considerations. ORDC owns and manages the railway corridor via agreements with the train operator, now Gio Railways, and the Orangeville-Brampton Rail Access Group which includes manufacturers who use the line. 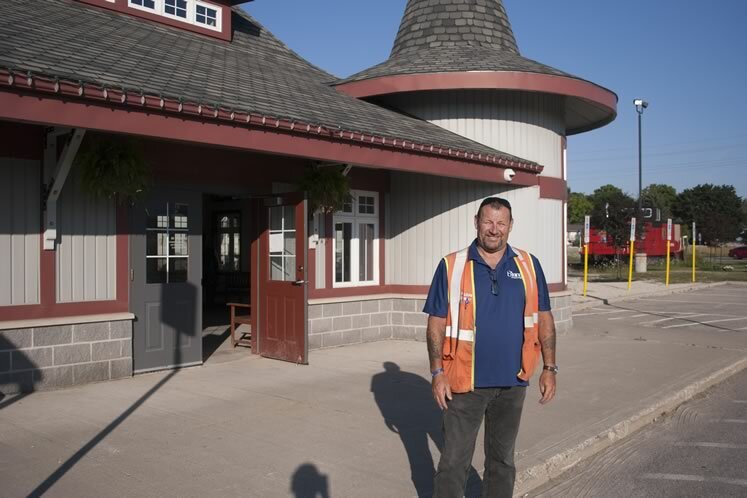 Paul Robinson, operations manager at Gio Railways, stands outside the Orangeville train station in July. Photo by Warren Schlote. The Town receives no revenue from ORDC, but supports it financially, contributing approximately $400,000 per year to ORDC. OBRAG is responsible for overseeing maintenance on the line and its day-to-day administration. Six companies currently use the service. The Orangeville branches of Clorox, Röchling, PolyOne and Novolex receive rail shipments of plastic pellets for packaging and other products. Two multinational companies in Brampton, Kleen Performance Products and Armacell, receive shipments of cleaning chemicals and plastic, respectively. 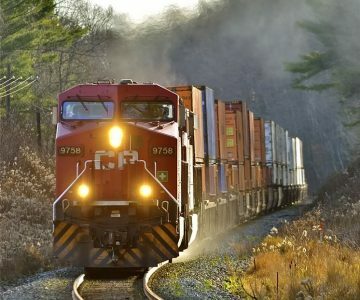 The railway ships about 500 carloads per year, the equivalent of about 3,000 to 4,000 truckloads, according to OBRAG general manager Peter Gorski. Elsewhere, the number of passenger and freight lines continues to dwindle. This decade, passenger services, including the Ontario Northland’s Northlander and the Algoma Central Railway passenger service, have closed. 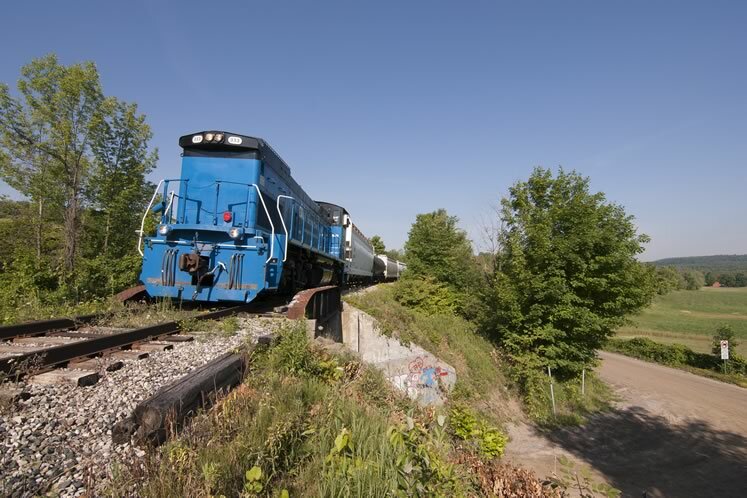 And CPR ended its daily truck-trailer train between Milton and Montreal in June. A handful of tourist and excursion passenger trains still operate around the province, offering a chance to experience a bygone way of life, if not an efficient way to get from point A to point B. There was little fanfare on July 2, a few days after Bradley’s run, when Gio Railways’ bright blue leased locomotive pulled into Streetsville Junction for the first time. 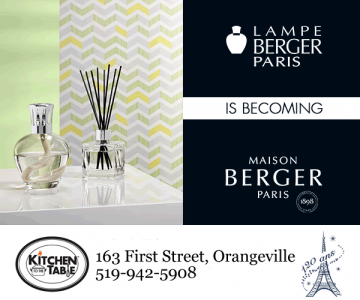 The following day, the new crew would make their first solo trip from Streetsville to Orangeville. The bright blue Gio Railways locomotive hauls freight cars in late July through the hills of Caledon. Photo by Warren Schlote. Who are these new operators? Welland-based Gio Railways is a subsidiary of Gio Rail Holdings, whose president is Gerry Gionet. Another subsidiary, Trillium Railway, operates the Port Colborne Harbour Railway. Gio Railways operations manager Paul Robinson, who also oversees operations for Trillium Railway, says the OBRY contract reflects the company’s desire to expand its presence as a shortline operator. The previous ownership at Trillium operated a small railway in St. Thomas, but it shut down in 2013 due to extensive repair costs on CN-owned bridges along the line. In contrast, Robinson says the OBRY’s track conditions are good. “Considering its age, it’s been very well maintained,” he says. That includes the famous 85-foot-high trestle over the Forks of the Credit which was built in 1879 and requires a lot of maintenance. Its wooden span over the river was replaced with metal in 1910, but the wooden approach on both sides is still intact, buried beneath a layer of earth. The bridge received extensive repairs in 2017 and was recently recertified for another year. 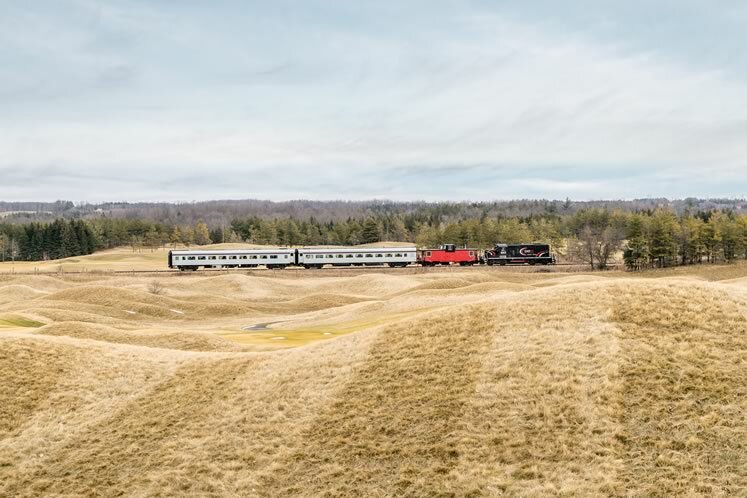 The Credit Valley Explorer glides through the rolling hills at Caledon’s Osprey Valley Golf Club during its final excursion on the OrangevilleBrampton Railway on February 30. New operator Gio Railways has no immediate plans to bring back the tourist service. Photo by Warren Schlote. Although they do not transport the same quantities or operate with the speed and efficiency of national rail companies, shortlines are crucial to rail service. The mainline operators don’t really serve out-of-way small industries, but those small industries still need to buy in bulk, says Robinson. However, due to their small customer base, shortlines can crumble if just one industry pulls out. Gio Railways’ experiences with local shippers has so far been “very positive,” he says. For train lovers who hope to ride the rails on a tourist train, however, the news is less positive. For now, only plastic pellets will travel through the rolling hills and forests of the Credit Valley on the OBRY. Gio Railways has not yet decided whether it will bring back a passenger train like the Credit Valley Explorer. “We need to make sure we’ve got our feet under us with the freight before we even entertain any thoughts of that,” says Robinson. Restarting the passenger service would require expensive liability insurance and replacing the passenger equipment that left with Cando’s departure. One local favourite was the annual sold-out holiday runs of the Credit Valley Explorer’s Santa Train between Orangeville and Inglewood. Kids dressed in their Sunday best squirmed in their seats, waiting for Santa to walk the aisle and listen to their whispered Christmas lists, followed by Mrs. Claus sharing her baked treats. Inglewood resident Carolyn Wadley and her husband have fond memories of taking the Santa Train with their now-nine-year-old son for many years, saying it was, “Like a condensed version of Chris Van Allsburg’s Polar Express, complete with the bell each child was given by Santa.” For the grownups, the trip also showcased picturesque winter scenes of the area rarely seen from the road, she adds. Although running nearly 80 Santa Trains per year became repetitive, Steve Bradley remembers how the kids’ energy kept the crew going. “Their anticipation and smiles made all of us happy,” he says, noting his favourite moment was letting his grandson into the locomotive cab with him for a photo. Looking back, Bradley remains philosophical about his many “last chapters,” intersecting with upheavals in the industry. Before the final Cando run on the OBRY, he was the engineer on the last Credit Valley Explorer trip and the final freight run. He also ran the last train to Collingwood back in 2009 on Cando’s sister operation, the Barrie-Collingwood railway. (Bradley also flew Air Canada’s last commercial Boeing 727 flight when he worked as a pilot. The milestones Bradley has been part of have not all resulted in closures. “I actually do have one first,” he says. “I was on the first course as a first officer when Air Canada got the new 767s.”) But he’s not out of trains for good; he’s working as a “spare guy” for the Barrie-Collingwood Railway. Regardless of what company operates OBRY, it will draw interest from admirers of all kinds. Railfans have an unfamiliar operation to study and a new crew to befriend. Local companies or those looking to move to Orangeville may look at Gio Railways’ commitment as a sign the railway is strong and able to support their business. If an iteration of the Credit Valley Explorer returns, passengers will be eager to see their favourite country scenery from a fresh vantage point. And as those thundering train horns blare, halting traffic as the OBRY crosses a country road, the new trains may spark an enduring fascination in the toddler waving from her car seat. One day, she could be the one in the engineer’s seat, smiling back as she carries on the historic tradition of railroading in the Credit Valley. Warren Schlote recently graduated in media studies from the University of Guelph-Humber and is now a reporter with the Manitoulin Expositor in Little Current, Ontario. 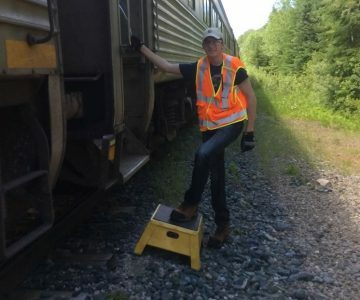 Meet the railfans, train lovers who track everything from locomotive makes and models to the schedules and freight loads of their favourite railways. Journalist Warren Schlote considers himself a railfan. Here’s how he parlayed his love of trains and railways into a stint as a real-life conductor. To the railways themselves, we are generally another set of eyes trackside, helping to keep things running smoothly. 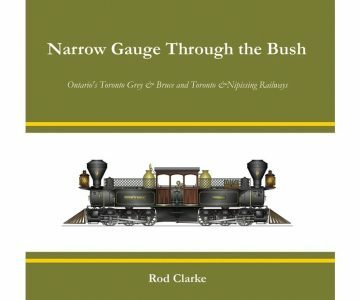 The Toronto Grey & Bruce and the Toronto & Nipissing Railways were the first of their kind on the continent. There were new markets, an expansion in available goods, new opportunities and, above all, a new lifestyle: people here had become connected to the outside world. A hobby can keep your brain running on the rails. Here is hoping the Credit Valley Explorer returns soon. Hello – The Santa train was always a highlight for my grandchildren. We cannot find a Santa train anywhere that is as authentic and perfect as the one on the Credit Valley Explorer. 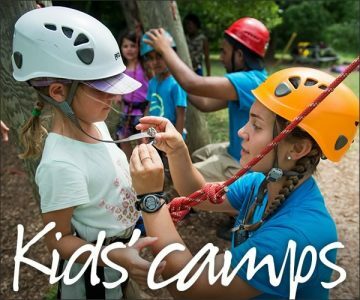 What has to happen to have this wonderful experience for children return to the Orangeville station? Raise the price if necessary but please somehow bring it back for the kids. Does the exact same perfect experience exist anywhere else? 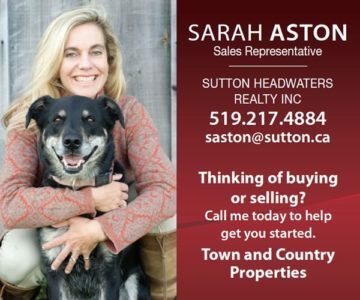 Hoping to take a ride from Orangeville on the Santa train in 2019. Please let me know what will happen.